Nikola Vucevic takes the ball to the net against the Philadelphia 76ers at Amway Center Wednesday, November 14, 2018. Photo: Willie David/Florida National News. ORLANDO, Fla. (FNN SPORTS) – After Markelle Fultz hit a buzzer-beating layup to put the Philadelphia 76ers up by 11 at the end of the third quarter, Orlando Magic Head Coach Steve Clifford knew his team had something left. 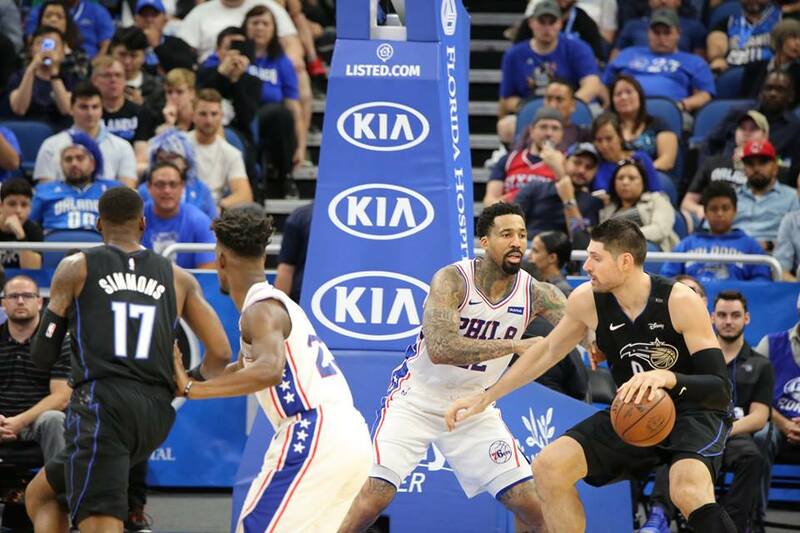 Down by as many as 16 points in the final quarter, the Orlando Magic went on a 21-0 run not only to take the lead, but they were able to hold off the 76ers at home by the score of 111-106. During the run, the returning Jonathan Isaac led the charge. Isaac had six rebounds and a huge block on Joel Embiid at the rim, helping the Magic to take control of the game in the final quarter. Nikola Vucevic and Terrance Ross combined for 19 points in the quarter and Ross hit a couple of huge 3-pointers to provide the difference. Vucevic finished with a game-high 30 points and grabbed 8 rebounds in the victory. He shot 10 for 19 from the floor and his ability to pass from the high post was invaluable to the Magic victory tonight. Aaron Gordon had a solid all-around game scoring 17 points, grabbing six rebounds and having six assists and Ross continued his outstanding play off the bench by scoring 15 points including three 3-pointers. The Magic ruined the debut of 76ers swingman Jimmy Butler. The former Chicago Bull and Minnesota Timberwolves All-Star only had 14 points and four rebounds in his first game with the team. Butler was officially acquired along with Justin Patton on Monday in exchange for Robert Covington, Dario Saric, Jerryd Bayless and a second-round pick in the NBA Draft. Orlando returns to the court on Saturday night as they start a rare home back-to-back set of games as they take on LeBron James and the Los Angeles Lakers at 7pm.